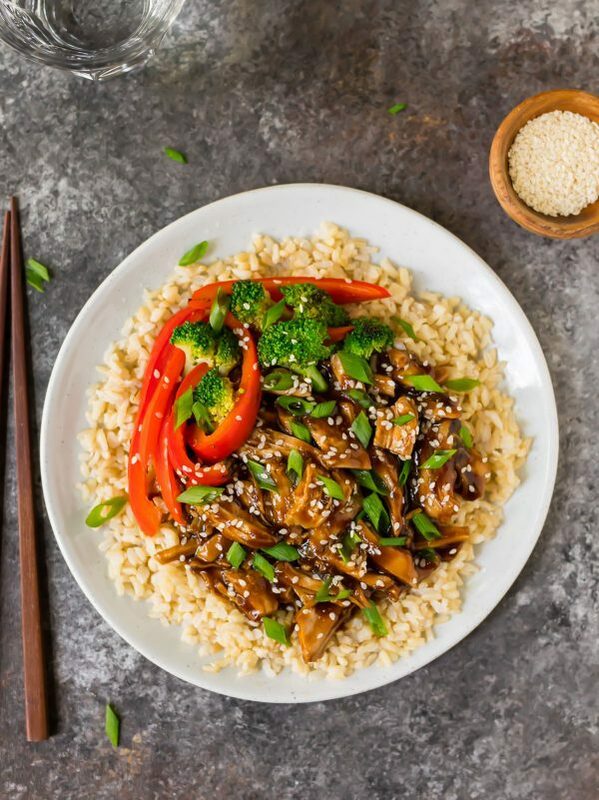 Sweet, sticky, and simple Instant Pot Teriyaki Chicken for your healthy dinner menu! This is a wholesome twist on the takeout favorite that I spent the better part of my high school years ordering at the mall food court. It’s made with everyday ingredients (you don’t need store-bought bottled sauce), the Instant Pot does the work, and you can make it with chicken breasts or chicken thighs. Serve it with rice and a side of veggies, and you have yourself a knockout dinner that beats the pants off of takeout every single time. The seniors in our high school were allowed to leave campus for lunch—all 30 minutes of it. The short window left us with few options that would allow us to make it back to class on time, so Asian fast food was a frequent go-to. Looking back, I can’t believe poor-quality “Chinese” food was how I chose to spend my hard-earned cash (I worked a fairly low-paying hourly job), but it clearly left some kind of culinary impression. Recreating those familiar menu items in clean, healthy ways has become one of my favorite ways to cook. In fact, as I’m typing this, I took a quick peek at my recipe index and…well, we have some evidence: Slow Cooker Beef and Broccoli (and um, Instant Pot Beef and Broccoli plus this stove top Healthy Beef and Broccoli), Pineapple Chicken, General Tso’s Tofu, Crockpot Orange Chicken, not to mention all of these healthy stir fry recipes. Clearly, I am in this takeout fake-out food game for more than the fortune cookie. I have no intentions of ending my affections. 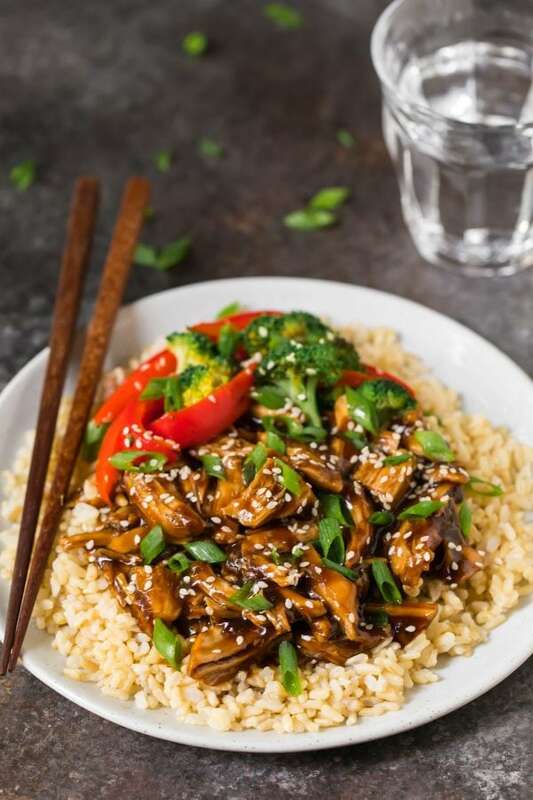 Recipes like this simple Instant Pot Teriyaki Chicken are appealing to both kids and adults, and you can easily add veggies and whole grains like brown rice or quinoa to make them a full meal. Making teriyaki chicken from scratch is also far better for both your budget and your waistline than anything store bought! The base recipe for this Instant Pot Teriyaki Chicken is my Crock Pot Teriyaki Chicken. Like the original recipe, this one is made of simple, homemade ingredients. Soy Sauce. I like and recommend low sodium. Rice Vinegar. A staple in any stir-fry sauce. This provides the acid that balances the teriyaki sauce’s sweetness. Honey. This replaces some of the brown sugar (most restaurant sauces are LOADED with sugar). Brown Sugar. We do still need a bit, but again, this far less than what you’ll find in a bottle or a restaurant. Fresh Garlic and Fresh Ginger. To bring the teriyaki sauce to life. Cornstarch. To thicken the honey teriyaki marinade into a thick, glossy sauce that coats every forkful. 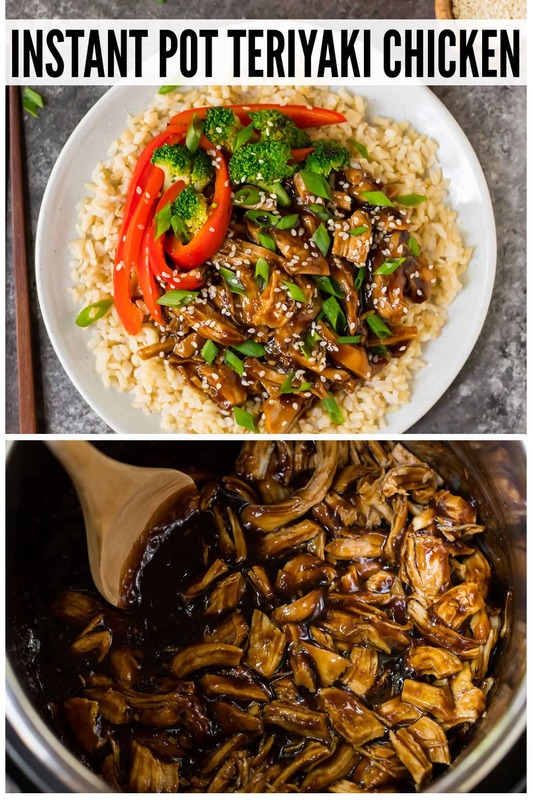 One mega advantage this easy pressure cooker teriyaki chicken recipe has over my slow cooker version is that everything cooks in one pot. (This is the Instant Pot that I have and recommend.) 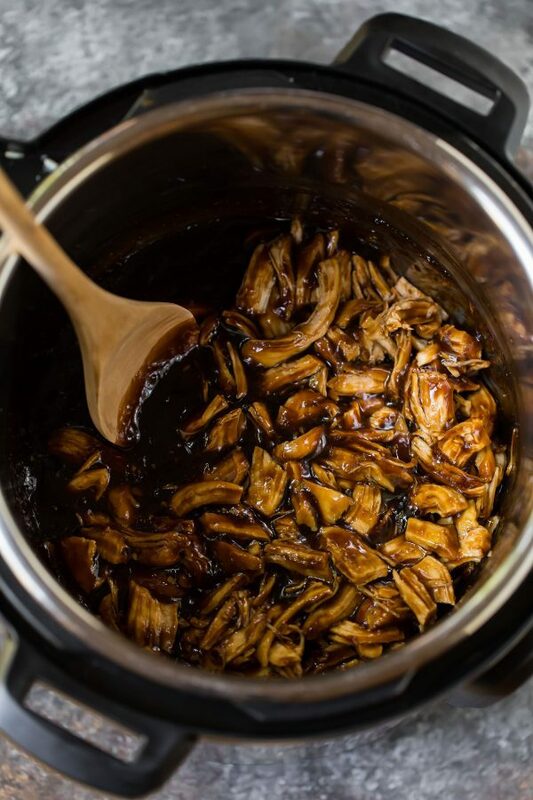 Instead of reducing the teriyaki sauce on the stove, you can do it right in the Instant Pot itself! Thank you sauté mode. Place the chicken in the Instant Pot. You can use chicken breasts, go for Instant Pot teriyaki chicken thighs, or even use frozen chicken. Stir the sauce ingredients together. Easy peasy. Pour over the chicken, seal, and cook! The amount of time will vary based on if you used breasts or thighs, as well as if your chicken is fresh or frozen. Remove the cooked chicken to a plate and shred it with two forks. At this point, it will be fall-apart tender. Switch the Instant Pot to sauté, then add the cornstarch slurry. Let it bubble and thicken into a glorious, hopelessly addictive teriyaki sauce. Stir the chicken back into the sauce, and serve! 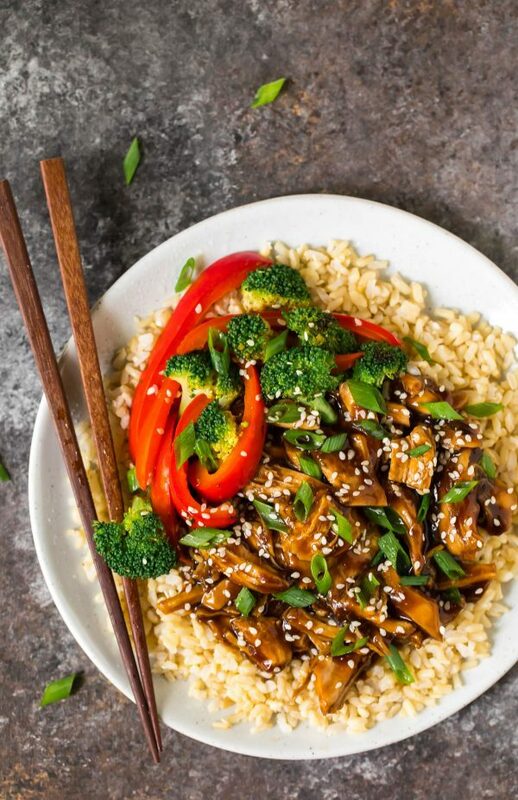 Keep it simple: serve Instant Pot Teriyaki Chicken with rice. Use brown rice for a higher fiber and protein content. You can make this in advance in the Instant Pot or on the stove while the teriyaki chicken cooks. While the chicken cooks, I like to steam or sauté a side of broccoli, then pile it all together with the teriyaki chicken and rice to make Instant Pot teriyaki chicken bowls. For a lower carb version, use cauliflower rice or even broccoli rice. Frozen Chicken Breasts (about 10 ounces each): 12 minutes of high pressure + 5 minutes of natural release. Fresh Chicken Breasts (about 10 ounces each): 12 minutes of high pressure + 5 minutes of natural release. Frozen Chicken Thighs (about 6 ounces each) : 10 minutes of high pressure + 5 minutes of natural release. Fresh Chicken Thighs (about 6 ounces each) : 8 minutes of high pressure + 5 minutes of natural release. The exact cook time will vary depending upon the size of your chicken breasts or thighs. About 10 to 12 minutes is plenty for me when I’m cooking frozen chicken breasts that are around 10 ounces each. If your breasts are smaller, reduce the time by a few minutes. If you open the lid and your chicken isn’t done (it should reach 165 degrees F on an instant-read thermometer), you can reseal and cook the chicken a few additional minutes. Making this Instant Pot chicken recipe, I can’t help but smile at the thought of high school Erin sitting down to a bowl. I’m confident she’d approve, now adult-Erin certainly approves, and I know that you and your family will too! How to make easy, healthy Instant Pot Teriyaki Chicken from scratch! Made with simple ingredients and so much better than store bought. Lightly coat the bottom of a 6-quart Instant Pot with nonstick spray. Arrange the chicken breasts in the bottom. In a medium-size bowl, whisk together the soy sauce, water, rice vinegar, honey, brown sugar, garlic, and ginger. Pour over the chicken. Close and seal the Instant Pot. Cook on HIGH (manual) pressure for 10 minutes. Let the pressure release naturally for 5 minutes, then immediately vent to release the remaining pressure. Carefully open the lid. Turn the Instant Pot OFF. Transfer the chicken to a plate and let it cool a few minutes. Once you can safely handle it, shred the chicken with two forks or cut it into bite-size pieces. Turn the Instant Pot to SAUTE. Once the liquid begins to simmer, slowly whisk in the cornstarch slurry. Continue whisking to ensure the sauce is smooth and does not have any lumps. Continue to cook and whisk until the sauce thickens, about 1 to 2 minutes. Turn the Instant Pot OFF. Add the chicken back to the pot and toss to coat in the sauce. Serve hot with prepared rice and a sprinkle of green onions and sesame seeds. Store leftovers in an airtight container in the refrigerator for 4 days or freeze for up to 3 months. Let thaw overnight in the refrigerator. Rewarm gently in the microwave or on the stovetop, with a splash of water or chicken broth if you’d like to thin the mixture back out a bit.